Alongside all the big announcements Microsoft had to make at its education-related press event yesterday – including the Surface Laptop – the company also launched a (quite literally) lower-profile piece of hardware which is nonetheless an interesting addition to its peripheral line-up: a new Surface Arc Mouse. 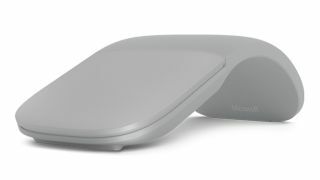 This is essentially a Surface-branded revamp of the Arc Touch Mouse, a peripheral that was launched some six years ago now, with the new version obviously making some key changes. If you’re not aware, one of the main selling points of this accessory is the fact that the mouse can be folded flat to make it more convenient and portable when carrying around, and then ‘snaps’ up into the curved position (as pictured above) for when you want to use the device. One of our criticisms of the original mouse was that it felt rather flimsy, and with the new Surface Arc Mouse, Microsoft has improved the design with a better snap mechanism and better build quality all-round. The other major change is that instead of just a central touch-sensitive strip that acts like a mouse wheel, the entire front section of the peripheral works like a touchpad, allowing for various swiping gestures to be used. And naturally, the new mouse is designed to match the freshly revealed Surface Laptop, and comes in several matching colors including burgundy and cobalt blue (there’s also a basic light gray color, as seen above). As to the price for the Surface Arc Mouse? It retails at $80 (around £60, AU$110) and is currently available to pre-order over in the US, with an expected ship date of June 15.